I’ve taken a little time off from our Frugal Fashionista posts, and I thought you might have wanted a break from my frugal fashion trips, but obviously not. I’ve received the emails and the requests so, it’s back..
One of my biggest problems that I encounter when doing these posts is that I always forget to take pictures when I am wearing the outfits. Enough excuses…on to what you’ve been waiting for. I am doing a two part post for this one. I have decided to take you through a typical thrift store outing and show you what I look for. Everything I am wearing in these pictures was from one shopping trip last week. My goal of this post is different. It’s not to put together my cutest ever outfits, but to show you how you can mix and match while spending pennies on the dollar. As you are reading, try and guess how much I paid for it all. You are going to drop to the floor! I approach my wardrobe much like I do my couponing and stockpiling. Many local thrift stores offer discounts on certain days. On Sunday, one colored ticket is always 75% off. Keep that in mind as you guess. I only looked at that color. With winter right around the corner, I love to look for new sweaters, turtlenecks and comfy clothes that I can wear to football practices. I need to be warm, but don’t have to look frumpy. A classic green Gap turtleneck will give me so many options. Here I paired it with the comfiest, down vest by Lands End. The only other option is to lose the eight pounds I’ve gained- ugh. 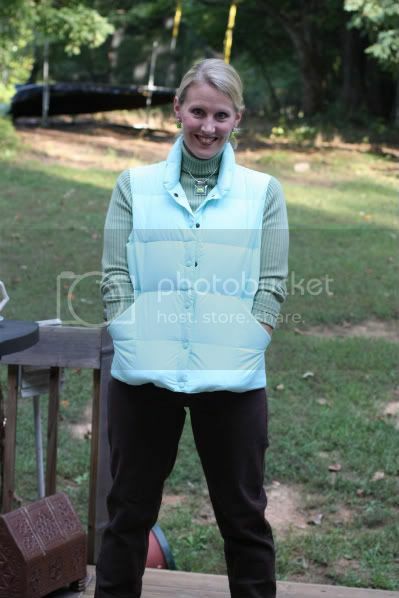 Here is the same turtleneck and pants paired with two jackets that were UNDER one dollar. Do you see how different all three outfits look just by switching them up a bit? Our NC fall days don’t always necessitate a heavy coat, so these are perfect. These are a typical find at thrift stores. One of my favorite finds of the day was this great black dress. If you’ve followed this series at all, you know I have a thing for the perfect, little black dress. I have about ten of them. Please.no.lectures. Just being honest. But, I wear them – alot. When something like this is so comfortable that you can sleep in it, I buy it…regardless. And this is one of those finds. I wish you could see my drop down pink necklace more closely. It’s perfect with the V-neck, but if someone gave me a big chunky pink necklace, I think I’d prefer that instead. It would make more of a statement and bring out the pink accents. This style looks great on almost any body shape. 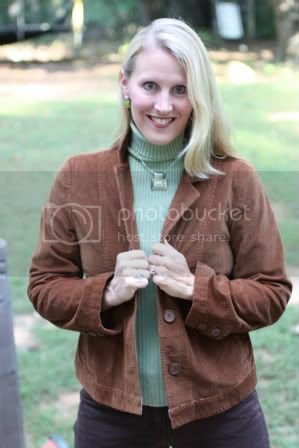 I love, love, love this classic Eddie Bauer turtleneck. I’m so disappointed that we didn’t get a better picture of it. The quality is so fabulous that it will always appear new, and the look will never go out of style. I am a “summer,” and “summer” skin tones don’t wear orange. But it’s fall harvest time, and I want to be festive. Yet more importantly, this was a BRAND NEW suede vest with the $69.00 price tag still on it and I got it for $1.50. I’m just saying. 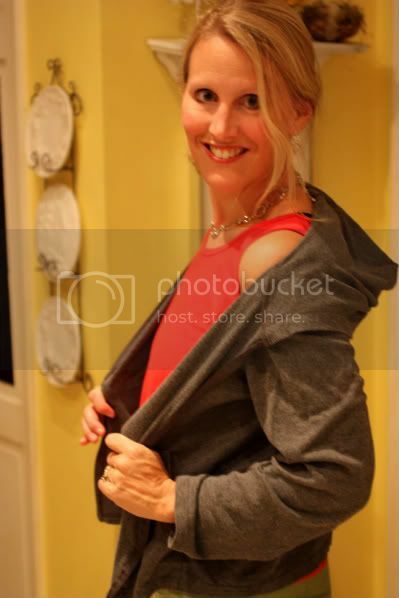 Yes, this was taken moments ago as I just got back from football practice and was sporting my cute Hanes hoodie and Liz Claiborne tank. If I dress to exercise, it sometimes gives me the false sense that I might actually walk during my boys’ practice. 🙂 Exercise clothing is expensive, but I find fabulous items for pennies. Probably because people like me fizzle out on their New Year’s Resolution quicker than they’d care to admit. Now imagine that I didn’t just get back from football practice, and that my hair was done in a sleek updo. 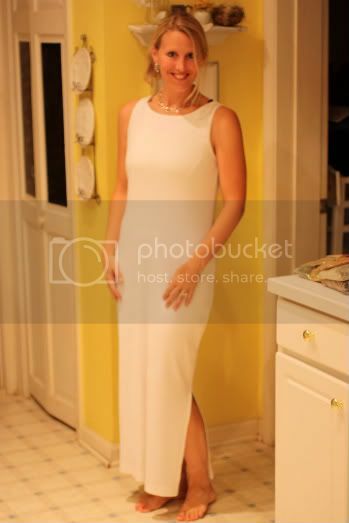 Oh, how I love this white dress from The Limited. Again, comfort is key and this one passes the “nightgown” test as well. Can you see why I have started wearing dresses more? Seriously, this dress is more comfortable than any pair of pants I own. Don’t be surprised if it doesn’t end up as a night gown after I get tired of it. When you spend $1 on something, who says it has to be an elegant dress? Why can’t it be a nightgown…hee hee. Ok, so that was all purchased in one shopping trip. Remember, it doesn’t always happen like that, but I am fairly consistent in popping into my favorite stores and I have it down to such a science that I could dress almost any of you in a complete wardrobe for under $100. Come with me next time as I show you how I look through the trash and come out with the treasures. Did you take a guess at how much all of this cost? Remember that I ONLY looked at the colored tags that were marked 75%, and the majority of the other items in the store were full price. I am going to duck now because I know you are going to throw tomatoes at me. Seriously inspirational! I don’t know what’s holding me up, I always shop sales and outlets, I’m not afraid of something used, but I am awful at looking through lots of stuff to find the treasure. I hate shopping and I have no patience. Keep the advice coming! One of these days I’m going to head over to a thrift store and buy me a great outfit and send you a picture. Wow! that is all I can say. You found some great stuff and didn’t pay an arm and a leg for it. We don’t have very many thrift, goodwill stores here and I have yet to find a salvation army store. My daughter has better luck finding cool stuff. She is tiny…a size 4. Thanks for taking us shopping with you. Thrift store shopping for larger sizes is not as easy. Plump figures and faces have to be so much more selective in what styles they choose, and they don’t look good in turtlenecks and straight-line dresses. hi Kim – Thanks so much for sharing this concern. I wish all the comments would have transferred from my old site. Oh that would be great if you did a plus sized thrifty finds! I’m plus sized and HATE going to thrift stores for myself but I always find awesome things for the kids. i wish we had more thrift shops around here. your bargains make me jealous! I am a thrift store shopping junkie. The junior league in our area does a huge thrift sale and I scored three bags of beautiful clothing for all of the events I have coming up. I feel like a million bucks in them and most only cost a dollar or two each! I love that!! Great ideas, Jen! all I can say is W-O-W! Those finds are amazing! There is a Goodwill in my area that always has fantastic quality items, but I have never looked at the clothes. You are inspiring me to go look there. Thanks for sharing. 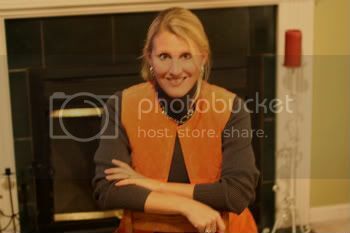 LOOOVE that orange vest! I agree with you about thrift stores-my whole family dresses from there. 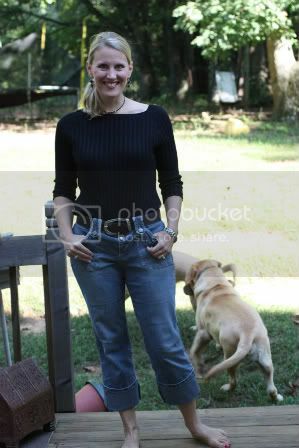 My boys can be found in Ralph Lauren shirts(for $1) and my girls even wear boutique clothing. I never pay more than $3 for kids items unless it’s a special dress or coat. We have an Amvet near our house and kids clothing is .79!!! 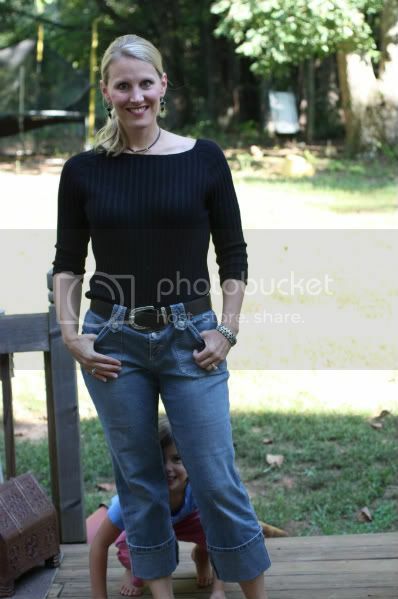 Capris can definitley be worn into fall in the south. And if you have ridiing boots-even later. Wow! Unbelievable! And yes, I am so jealous of such great pieces. Our thrift store just doesn’t have that kind of stuff, I do live in small town Indiana, after all. And, in this recession, it seems that most everything is picked over these days. Oh well, I will continue shopping clearance at my favorite stores and live vicariously through awesome shoppers like you! Get out of town! I can’t believe all of that was under $12 bucks. Honestly, that is amazing! WOW! Totally awesome. You need to tell me how to dress so chic and elegant. Skirt/dress pretty much only here. But I’ve got a size 8 waist/ 14 hip/ 14 bust. Finding clothes is F.U.N. NOT! What a cool thrift store! Great finds! I am a thrift store shopper myself. Always wearing designer brands, Michael Kors, Lilly Pulitzer, Ann Taylor, White House Black Market. I dress better than I ever have for less money!! I am jealous of your prices. Our Goodwill has a weekly color 50% off but they spend the week with several employees pulling those colored tags off the racks!! How crazy is that? Do you want to sell it or not? Just wishing I could get some of my outfits 75% or even 50% off! New Reader. Fascinating. 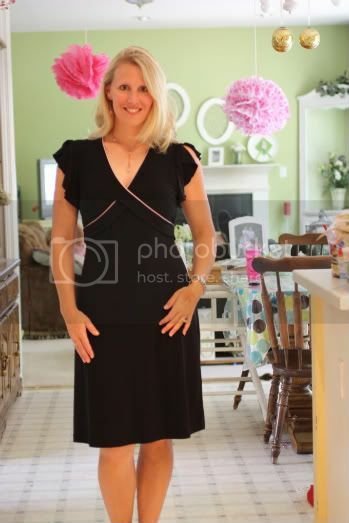 I will agree with a prior poster though – I go thrift store shopping regularly and cannot find much for me – I am larger-than-average (not plus sized but close) and tall with a long torso and large bust. Straight dresses do not work, the black dress would be too short to be comfy or modest, and turtlenecks are horrid on me (although I’ve never thought to pair them with a vest). Oh you go girl! My co-workers know when they compliment me on what I am wearing and all I do is smile, that I either purchased it at a garage sale (summer months) or at a trift store. I just love it!! Love the clothes. I also shop yard sales, thrift stores and Goodwill. I probably have the cheapest wardrobe ever. Last week, I bought a garbage bag stuffed full of clothes, including a new winter coat for my daughter, for $5.30 and 3 small bags of clothes yesterday for $4.00. All of them were brand names and looked brand new. You don’t have to spend a fortune to look great. Where in NC are you shopping? I live about an hour north of Charlotte and you seem to have a good selection of thrift stores to shop from! I don’t seem to be in just the right location! I have recently discovered the thrill and joy of thrift store shopping on those 50-75% off days. My husband and I spent less than 20 bucks for 4 UNWORN Banana Republic dress shirts for him, 2 skirts for me and 2 button downs for me as well. Way to go on your finds! I look forward to reading this series! Thank you for your inspiration! The outfit I wore yesterday was almost all thrift stores or yard sales. A colleague said I looked “sophisticated”. The cost for the whole outfit including boots was at most $10. 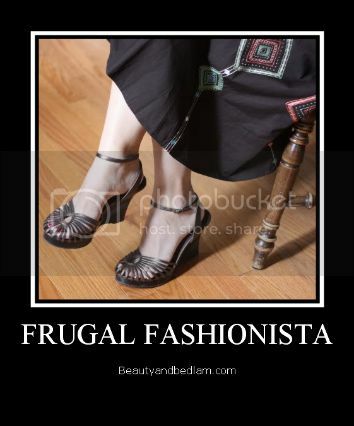 Thank you so much for convincing me to try the frugal fashionista ways! I am ridiculously impressed! I recently moved and need to find a new thrift store circuit to check out. Those are some amazing finds you have there! Where did my comment go? I know I’ve commented on this… maybe it’s at your other address? Anyway — when should I book my plane ticket to visit so you can take me through the thrift stores?! I live in Charlotte NC and would love to know some of the exact stores you frequent. Where do you go that has discounts on different colored tags? The Goodwill I used to shop in OH used to do that, but like you said, now the Goodwills in Charlotte have the same prices everyday. I’d really appreciate some more details! I admire your eye for accessorizing outfits from your thrifting finds. I’m a long term thrifter, but I don’t have that touch for putting an outfit together. Your blog has given me a lot of inspiration this past week. 1. How much closet/dresser space do you have!?! 2. Do you limit your choices to wash-at-home items? I am in NC about 45 mins from Charlotte and 30 mins from Lake Norman. I think your finds are really awesome deals. I would enjoy finding some deals like that , but I don’t most of the time. My hubby does for his clothes at the goodwill in Hunters ville . Keep posting you finds, I know it helps so many people.